I’m a big movie fan, so you’d think I would enjoy going to the cinema. To be honest, I kind of still do. Where else can you see the newest movies on a nice big screen with great sound? But a part of me sees the actual experience as a chore. Yes, I want to see movies in the cinema, but there are so many things wrong with the cinema experience that I wonder if it is actually worth it. If you have a big enough TV set at home, what is the added value of going to the cinema? The traditional concept of the movie-going experience desperately needs a complete reinvention (FourStarters did a post about this a while back). This is the first in a series of posts where I want to focus on how cinemas should be (and in some cases are) adapting to the altered demands of cinema visitors. 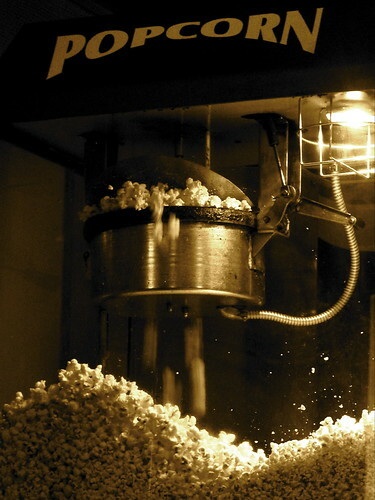 Before we actually come to that though, I want to identify the common problems that occur with today’s cinemas. Keep in mind that these are 10 general problems; it doesn’t mean that all cinemas have each of these problems, although most of them will have more than one problem. Some of these problems also have very simple solutions, but none the less they keep occurring. Raise your hands if you’ve ever been to a cinema where the movie was out of focus or had too many scratches on it. I’m hoping a lot of you just raised your hands (or at least nodded in agreement) and are annoyed by the fact that this happens so often, but the truth is most movie audiences don’t care about the projection quality. Poor projection quality is purely caused by incompetent projectionists, who mishandle the reels and don’t adjust them properly [FirstShowing]. If movie goers would complain about this, something might be actually done, but the fact is most people don’t complain. I’ve had a couple of times that we were the only ones during a crappy showing that stood up, left to find an employee and complain about the quality. Some people might just be plain lazy or don’t think it’s something worth complaining about (which I find ridiculous, you’re paying to see this movie here, right? ), but most people just don’t know what good projection quality is [FirstShowing]. They’ve never experienced how it should be done the right way; this bad projection quality is all they’ve ever known. It’s a problem, which has a simple solution (train/force the projectionists to set-up the movie properly), but if people don’t see it as a problem nothing will be done about it. With bad volume I mean that the movies in cinemas are too loud or too soft, or something a bit in between, where in the same movie the action sequences are too loud and the dialogue is too soft. I always thought this was again simply a problem with cinemas, but after doing some reading, I found out it’s a bit more complex than that and not always the cinema’s fault. Some times the cinema does turn up the volume way too loud, but that’s not always the case. Nowadays a lot of movies are actually made too loud (as in containing segments above 90 db) and cinemas show them as they are meant to be shown, meaning it is often the fault of the studio that produced the movie. 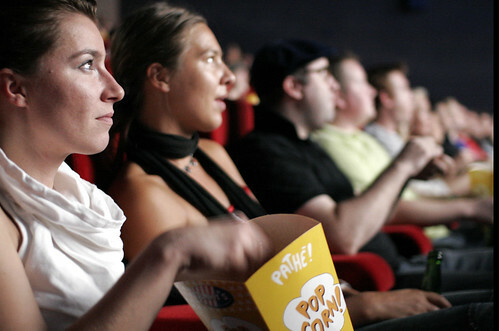 Other times the cinema chooses to lower the volume, so that too loud parts are under the allowed limit, but which causes the rest of the film to be too soft. This same thing can occur when the sound is adjusted for trailers in front of the film. This article gives a good example of an action movie trailer in front of a romantic comedy. The volume is turned down, because the trailer is too loud and the volume stays this way for the entire movie. 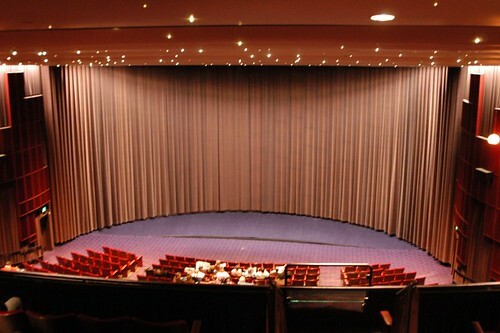 People often complain that some cinema screens are too small and that a bigger screen means a better experience. I disagree. In my eyes it’s all about the relative screen size (I’ve touched on this before in Why Expensive Cinemas Are Not Necessarily Better). It doesn’t matter how big the screen is, if you’re sitting far away from it. I’ve been to the Empire and the Odeon cinemas at Leicester Square and both screens (and auditoriums) are huge. The seats though, are placed on a not so very steep slope, so you’re sitting either A) quite far from the screen, or B) too low and have to stare upwards. Compare that to the Vue at Shepherd’s Bush or the Pathe Schouwburgplein in Rotterdam. Those are smaller auditoriums with smaller screens, but the seats are placed on a much steeper slope, so it feels like the screen is much bigger. 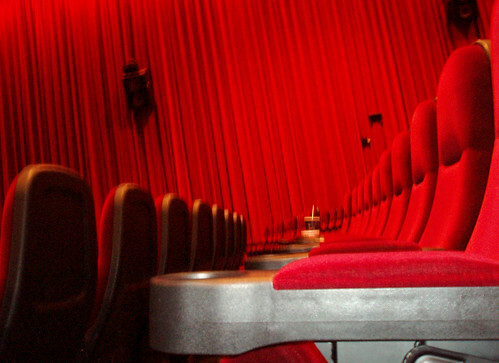 Cinema auditoriums should be designed to give the movie goer the best view, preferably no matter where you sit. Auditoriums are filled with as many seats as possible, not thinking at all of giving the optimal experience to the movie goer. Most of the time the seats are uncomfortable and small with not enough leg space. Then you have the theaters where all the rows are on the same level (no slope); if it’s busy, chances are somebody is going to sit in front of you and block your view. Of course this is all because they want as many seats as they can in one auditorium. This is completely silly though, cause more often than not most of the seats will be empty. Yes, Friday and Saturday night might be packed, but the rest of week? It’s never, ever busy. 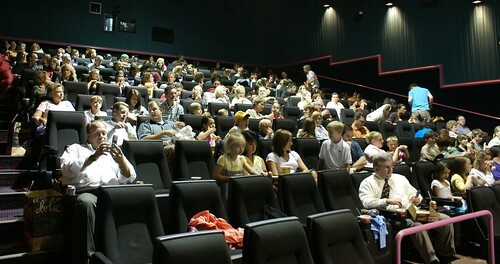 Cinemas should discard the idea of filling as much seats as possible and try to cater to the ultimate movie experience. Get nice big comfortable seats and place them in such a way that from every seat you have a good view. Question: you’re already stuck in a crappy seat with no leg space, so what do you with your coat and bags? Answer: you put it on the chair next to you. Nobody really wants to admit it, but everybody does it. If you’re with the two of you, you’re most probably taking up at least 3 seats (maybe even 4 sometimes). Doesn’t matter that you haven’t actually payed for those chairs, you’re going to put your stuff there. And if it’s busy? Well, then you’re forced to sit on your coat in your already uncomfortable seat and put your bags amid your already limited leg space. Why, oh, why can’t they find a solution for something as obvious as this? Cinemas are always ice freakingly cold. Now I understand why they do this; they’d rather have cold people, then sweaty, smelly people, right? But does it really have to be that chilly in there? It also wouldn’t be too bad, if you could snuggle up to your significant other. But no, the seats are too crappy to be able to do that (btw why are love seats always right on the back?). Turn down that air conditioner, please, we’re not popsicles. Okay, now I know this point really depends on the cinema; some cinemas handle it pretty well. I’m just ticked off by a couple of irritating past experiences. With seat selection I mean how the cinema deals with people picking their seats. A lot of cinemas still gives tickets with specified seat numbers, but you never really know if they’re going to abide to these seat numbers or not. I’ve had a couple of times that I reserved certain seats on opening night, only to show up and find out you can sit anywhere you want (one time for 13 people). Other times I’ve had it the other way around and you’re forced to give up your seats. While I really don’t mind one option over the other, I want to know before hand which of these rules to abide by. What always seems to work is tickets with no specified places. You just show up and claim your seats, first come, first serve, no hassle. Again this depends per cinema, but most don’t have a proper waiting area. Some of you might argue that it’s also completely unnecessary, but again I think it would add value to the whole cinema experience. Nobody ever arrives right on time when the movie’s about to start and most of the time you can’t go into the theater right away. There should be some area where you can sit down, get a drink and wait. I also see such an area not only being used before the movie starts, but also after it, a place where you can sit down for a moment and talk about the movie. While some cinemas have solved the problem of queues by using terminals, there a still a lot of them that don’t use them yet. Almost all cinemas I’ve been to here in London have terminals and this significantly cuts down the queues. But even without terminals, there’s a way to do smarter queue management. One particular cinema springs to mind, where even though you had reserved for a movie, you still had to pick up your reserved tickets in the same queue as all the people trying to buy a ticket for the same show. I hated this because all they had to do was scan my reservation and my discount card (you could buy a set of 6 tickets in one go on one card). Instead I had to stand in line with these people who hadn’t taken the time to reserve tickets. On busy nights these people often had a slim chance of getting in anyway, so they were wasting my and their precious time. You would think there would be a way to process reservations separately? Then you also have the horrible queues at the concession stands, prompting me never to get anything cause it just takes too long (plus side: it’s cheaper and healthier). What I find the most exasperating innovation: the combined tickets and concessions booth? Yes, let’s make people wait even longer in line! Problem number 10 is just a minor problem, but honestly “9 problems” doesn’t seem as catchy as 10. So my last problem with cinemas is that in some it is very unclear for what (often very short) period of time a movie runs in the cinema. This problem really depends on where you live and how big your town/city is. I understand the “why” behind it: for smaller cinemas it is sometimes not worthwhile to have a movie play for a longer amount of time. This doesn’t lessen the irritation though when you come to the realization that a movie was only playing for 1 week in the cinema and you missed it.